Now this is cool. Leave it to engineers. A paper in the June 4 issue of the Proceedings of the National Academy of Sciences finally provides the answer to a question we've all been wondering about all our lives. What happens to insects when they're hit by raindrops? As Dickinson et al. point out, water drops can weigh more than 50 times what a mosquito weighs. So, when hit by a water drop, does an insect crash to the ground? Outfly it? Not notice a thing? 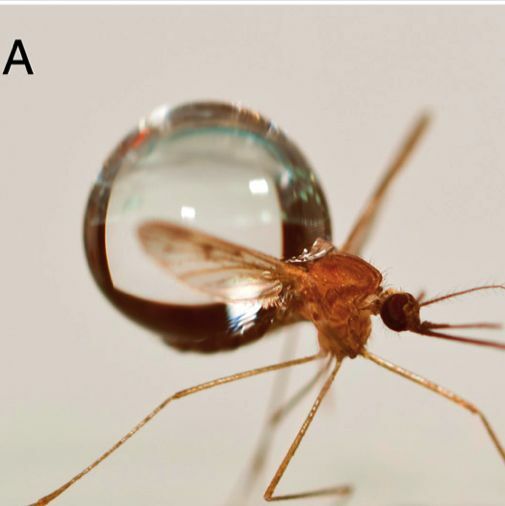 A mosquito’s strong exoskeleton and low mass renders it impervious to falling drops. The mosquito’s low mass causes raindrops to lose little momentum upon impact and so impart cor- respondingly low forces to the mosquitoes. Our findings demonstrate that small fliers are robust to in-flight perturbations. Mosquito and raindrop, Dickinson et al. The effect of rain on larger flying objects like bats and planes is well understood, but not on smaller things. The effect of in-flight perturbations such as wind on insects has been studied as well (bees extend their legs in an effort to stay upright and on course, e.g. ), and it's not a surprise that it turns out that insects have numerous ways to correct for such perturbations in flight. It is known that many insects are able to repel large water drops to some extent (which is why insecticides are generally sprayed as fine mists), but the effects of rain on flapping flight haven't yet been studied. Until now. The authors calculate that the probability of a mosquito being hit by a raindrop during heavy rain is high. And the impact on the legs and wings is 3 times more probable than on the body, given the insect's body shape. To evaluate the effect, they set up a contained space which they vibrated so that the mosquitoes wouldn't land on the walls, and sprayed water in from the top to emulate rain. They first wanted to catch the effects of a 'terminal-velocity' drop, so they sprayed a jet of water into the container. Getting drops to hit the insects was apparently quite a challenge, but they finally did see and record this event six times. A mosquito is rapidly accelerated downward upon collision with the jet. Continued perturbations with the jet tumble the mosquito repeatedly... After tumbling a distance of 39 mm, or 13 body lengths, the mosquito finally separates laterally from the jet and lands on the side of the container. 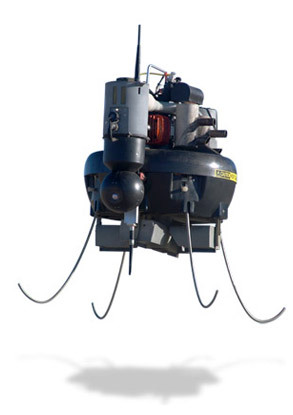 The six mosquitoes tested each separated from the jet before striking the bottom of the 20-cm tall chamber. It was noteworthy that all the mosquitoes survived the collision, as shown by their flight after a brief resting period. These experiments confirm that mosquitoes can survive impact with terminal-velocity raindrops, which have even less momentum than the jets used. If you have access to the PNAS site, there's a lovely movie of all this in action, with explanations. If a mosquito is hit by a water drop at lower velocity, the drop might cause the mosquito to yaw or pitch a bit, but it very quickly recovers. And, as predicted, the wings and legs were more likely to be hit but if the insect receives a direct body blow, it falls 5-20 body lengths at the speed of the drop but then is able to separate itself from the water and continue its flight. This suggests that the drop imparts very little of its force to the insect, but it also suggests that the mosquito shouldn't fly too low during a rainstorm. Clearly, mosquitoes are able to survive impacts from both low- and high-speed drops. In the collision of two bodies, the outcome is known to be highly dependent on the masses involved. We thus hypothesize that mosquitoes survive drop impacts by virtue of their low mass: Specifically, the low mass of mosquitoes causes a falling drop to maintain most of its speed after impact and apply a correspondingly low impact force to the mosquitoes. the momentum and force imparted to the insect is determined entirely by the insect’s mass relative to the drop. The mosquito is so lightweight that the resulting force imparted upon it is low, enabling a mosquito to survive flying in the rain. This result is in stark contrast to the resulting force on immobile surfaces for which splashing and large momentum transfers occur. Although the raindrop force imparted to a mosquitoes is low, the mosquito’s low mass causes the concomitant acceleration to be quite high. Insects struck by rain may achieve the highest survivable accelerations (100–300 g) in the animal kingdom. In comparison, the current champions of generating acceleration are fleas, which experience 135 g when jumping. The similarity between these maximal accelerations may suggest a fundamental limit to survival among organisms. Describing the the results, Dr Hu cited the Chinese martial art of Tai chi. "There is a philosophy that if you don't resist the force of your opponent, you won't feel it," he explained. "That's why they don't feel the force; they simply join the drop, become one item and travel together." But why would engineers be thinking about any of this at all? OK, yeah, it's interesting to think about how insect flight evolved, and they do give a nod to this, but mostly it's because of flying robots (or rather, "micro-airborne flying vehicles"-- MAVs), envisioned for use in surveillance, search-and-rescue and who knows what else. The concern is what will happen to these tiny flying objects when it rains. "Not much" is the answer that will make engineers working on these things happy.